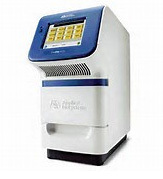 Our laboratory utilizes the Applied Biosystems StepOne PlusTM Real-Time PCR system. We have extensive experience designing and performing qPCR assays using both TaqMan and SYBR green detection chemistries. Our qPCR workflow involves RNA extraction and QC, cDNA conversion, primer design and validation (if necessary), reference gene optimization and data analysis. Our SYBR Green primer design and validation service involves optimization for amplicon size and primer specificity using both gel electrophoresis and melting curve analysis. We also perform an analysis of the efficiency of amplification for our designed primer sets. Our gene expression analysis generates a report detailing differential gene expression across the dataset using the comparative Ct methodology between control and treated samples. Using real-time PCR, you can easily analyze the expression of a group of genes. The picture above is an example of treated LC-11 cells that were run using Qiagens' Human Fibrosis RT2Profile PCR Array.